With 5 courses in the top 100 globally, and home to Australia’s oldest golf course, Tasmania is your ticket to a truly unique golfing experience. Breath in that crisp coastal Tassie air amid rugged cliff tops and verdurous landscape, sample our cool climate wines and taste produce sourced directly from the land and ocean before you as you swing your club in some of the world's most renowned courses. With 65 golf courses spread across our island state, from traditional links to parkland, we have narrowed the list down to 8 truly unique golfing experiences for the bucket list. 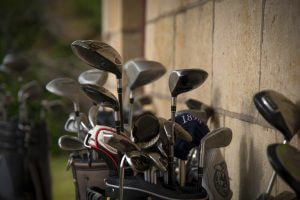 Image thanks to Cape Wickham Golf Course. Pastoral terrain outstretches along Tasmania’s scenic coastline where you can immerse yourself in links-style play. Swing a club at Australia’s oldest golf course, ‘Ratho Farm’ at Bothwell in Tasmania’s Central Highlands, where golfing legends of Scottish immigrants date all the way back to 1822. Image thanks to Adam Gibson. 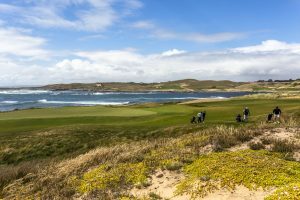 Venturing further north, and just a hop, skip and a jump from the mainland, the world class golf courses of Barnbougle Dunes and Lost Farm curve their way through the momentous dunes that spill out and touch the edge of the ocean. An array of holes cater to punters of all abilities, whether you’re a social voyager who welcomes an occasional hit in between cocktails and oysters at the Dune Clubhouse, or a diligent competitor who rallies from dusk until dawn in an isolated setting. Image thanks to Andrew Wilson. 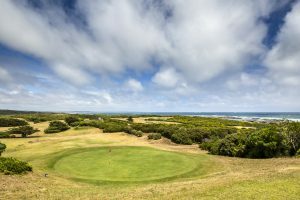 Finally, the windswept greens of King Island have taken the golfing experience to an entirely new level, where the routing of holes champions all elements of the island’s natural wonders. 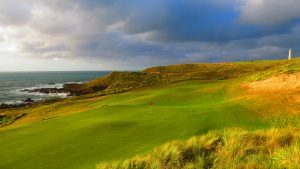 Combining world-class golf with pristine surrounds and premium eats sourced from the islands own backyard, King Island’s Cape Wickham and Ocean Dunes should be high on your bucket list. Abundant rainfall, salty air and mineral rich soil makes King Island the perfect environment for dairy production. Rich in history dating back to the 1800’s, where shipwrecks crowded its shores, the green pastures of King Island are now home to herds of grazing dairy cows that produce some of the sweetest milk, cream and cheese in the world. Image thanks to Andrew Wilson. Of course, we understand that a keen golfer needs a place to unwind, refuel and watch the sun creep beneath the coastline at day’s end. Lucky for our golfing friends, nobody does hospitality quite like Tasmanians. Picture yourself after a long day of golf, sprawled across a chesterfield lounge in a hinterland suite with uninterrupted panoramic ocean views and rustic coastal surrounds. 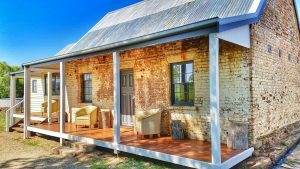 Perhaps you are sipping a glass of premium Tasmanian pinot gris, whisky or iced cherry cider and sampling the seasonal produce that has been dug and picked straight from the paddock for your plate. Tempting? We think so too. Image thanks to Tourism Tasmania & Rob Burnett. Tasmania's 5 golf courses ranked among the Top 100 greatest golf courses in the world.